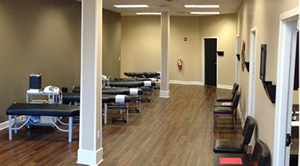 If you are looking for a skilled chiropractor in Kennesaw, GA 30152, check out Dr. Robert Mattson and the team at Due West Chiropractic & Rehab. Dr. Mattson's focus is on disorders of the musculoskeletal and nervous system. If you are having pain, you can schedule an appointment with Dr. Robert Mattson today; we will develop a tailored chiropractic treatment plan to eliminate your pain swiftly, but ensure long-lasting relief! Chiropractic care is used most often to treat neuromusculoskeletal complaints including, but not limited to, back pain, neck pain, joint pain in the arms or legs, and headaches. Often, these pains cannot be fully alleviated by traditional medical treatments or medications, requiring the specialized attention of a chiropractor. With years of experience in chiropractic treatments Dr. Robert Mattson will help you find pain relief. Dr. Robert Mattson has years of experience in a number of treatment modalities. The most common therapeutic procedure performed by our chiropractors is known as spinal manipulation. The purpose of manipulation is to restore joint mobility by manually applying a controlled force into joints that have become restricted in their movement as a result of injury. These injuries can result from a single traumatic event such as improper lifting or repetitive stresses encountered in daily life, all of which can compound and require a trip to the chiropractor. When a skilled chiropractor manipulates the affected joint and tissue, it helps restore mobility, thereby alleviating pain and muscle tightness and allowing tissues to heal. Chiropractic manipulation rarely causes discomfort. Here at Due West Chiropractic & Rehab, chiropractic treatment may complement or enhance medical treatment by relieving the musculoskeletal aspects associated with the condition. Often, when you need a chiropractor, you require quick, effective treatment, which is why we staff a chiropractic team that can provide comprehensive care. Before I came in to see Dr. Mattson, I could barely bend over. After my first session, I felt immediate relief. After each appointment I became more and more mobile. The decompression therapy really seemed to get me moving again. I was actually able to run a 10k (pain free) for the first time in a long time. I would recommend Dr. Mattson to anyone experiencing back, neck or hip pain. The Due West office was clean, inviting and relaxing. Thanks again, Dr. Mattson for all you've done. And don't worry I am still doing all of my stretches! – Candace C.